Elijah Brown is a wonderful man who is devoted to Seminole Golf Club in Juno Beach, Fla., and has caddied for more than 32 years. Browns character and commitment to the club caddying experience is a model for the caddie profession and exemplifies the best possible interaction between members, guests, staff and other caddies. Tom Gorman, Caddie Manager at Beverly Country Club. Gorman caddied at Beverly Country Club from 1952-1954. One of his first memories was taking caddie lessons from Ed Barr. He once teed off from the 16th hole first right-handed and then left-handed with the same club. Both balls went 250 yards down the middle. Little did he realize that years later his son would caddy for Barr would try to replace him. Gorman taught English and Latin at Saint Laurence High School for 35 years. In 1987, he became the caddie master at Beverly Country Club and have been there ever since. Through his work, he has been associated with teenagers for 47 years. DeLucca, 67, is the executive director of the Dade Amateur Golf Association, where he also runs a First Tee program out of the International Links of Miami-Melreese. Nobody in South Florida has introduced more juniors to golf. PGA Tour pro Dudley Hart and LPGA pro Cristie Kerr are among the legion of young players who have come through his programs. With athletics always a big part of his life growing up, Lucas was introduced to the sport of golf grandmother at age 10. He was hooked from the moment that he took his first swing of the club. Lucas played competitively up to a certain point and caddied in several pro-am tournaments that were in his hometown area of Cleveland. Lessons he has learned on the golf course are ones that he continues to apply today in his every day personal and professional life. Hats off to looping and the life lessons it teaches! 1. Make every moment/shot count once it is gone, it is gone there are no do-overs. 2. Plan ahead dont just think about now. Think about how the shot you take now will set you up for success with your next shot. 3. Bad shots and bad luck will happen though. Be ready to pick yourself up and get focused on what it will now take to succeed. 4. Be honest and full of integrity. Play it as it lies. 5. Be open to input and counsel from those with experience. Dont always think you have the solution to the challenges in front of you. Mr. Roger Martinez, PGA TOUR, and Club caddie. Roger has reached out to help PCA and the mission to help save the tradition of the game. 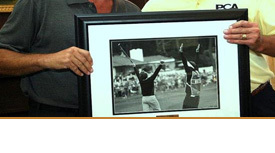 Roger has helped Gene Sarazen, Ben Hogan, Gary Player and Jack Nicklaus both on and off the course. The PCA is seeking nominations from the golf community to honor notable people who have started their careers as caddies, as well as professional caddies and caddie masters worldwide, please email PCAF@PCAFhq.org . PCA is an association open to all who support the mission. Companies, folks like you and caddies, working or retired, dedicated to elevating respect for the professional caddie. The organization and its Foundation partner work to provide the youth of the world the opportunity to learn both life and social skills through the game of golf and the profession of caddying, while enhancing their knowledge and interpersonal skills both on and off the course. In addition, PCA and its 10,500 caddies trained since 1997, and members worldwide strive to bring back caddies to the golf courses of the world, while preserving the tradition of this greatest of all games. 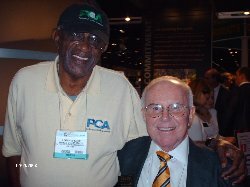 Visit us at www.PCAhq.com and www.PCAFhq.org for more complete details. Help caddies and supporters help caddies and others worldwide. To provide its members, caddies, their families and others with additional income opportunities, high quality benefits, services and certification thorough educational and communication programs worldwide. By introducing our youth to the 500 year old art and profession of caddying, we instill in them its core values of responsibility, discipline, integrity, awareness, respect and honesty: life skills and attributes all should aspire to possess. We will continue to elevate the respect for the profession of the caddie. We will pay homage to those who have filled a special role in the history of the game by inducting them into the PCA Caddie Hall of Fame. To bring back caddies and preserve the tradition of the game of golf for the kids.